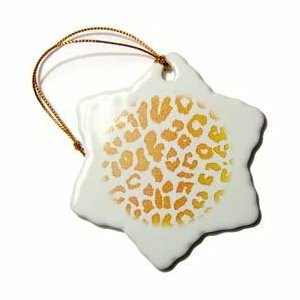 From the Patricia Sanders Creations collection this Orange and Yellow Leopard animal print Christmas ornament is measuring 3 inches. This Glossy Porcelain Snowflake Ornament is perfect gift for grandparents, aunts, uncles and friends. Commemorate each holiday season with a new ornament. It can be combined with the Janna Salak and Lee Hiller collections. Image is printed on both sides. Comes with the gold hanging cord.